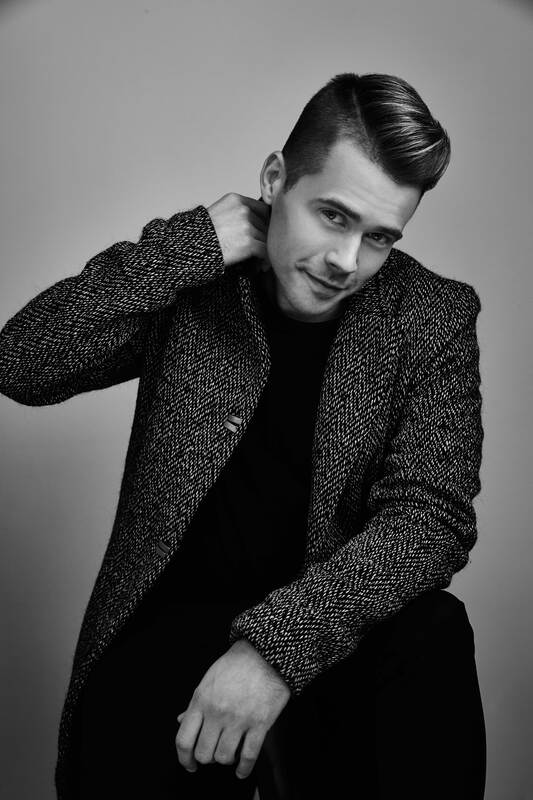 It’s a Bielfield pop chat; the Sydney singer songwriter is back with a hot new single with Courtney Act. But he’s also been taking the time to perform for classical audiences across the country alongside the Australian Brandenburg Orchestra. Such are his pop powers, he’s been juggling both effortlessly. Find out what he had to say in the midst of the madness of ‘Messiah’ and Mardi Gras. You’ve recently been doing some shows with the Australian Brandenburg Orchestra. How did they come about? I actually met one of the guys that works for the A.B.O. at the ARIAs. This was the first ARIAs I went to. I don’t know. I was being guided. Honestly, I had no idea what to expect. I didn’t know whether it was going to be a little thing or a big thing… it was a big thing. With thunderstorms. So yes at the ARIAs, this guy was leading us all out from our little holding… you know how they keep all the artists in a holding pen? I met him there. He said, ‘I’ve seen all your classical stuff, I love it, it’s so beautiful, why don’t you come sing for us?’. So I ended up going and singing for them. They actually had someone pretty much hired for this thing. Some Irish guy or something and they cut him out for me. No, no… it wasn’t that dramatic. So for people who weren’t at the concerts, what was your role there? It was ‘Messiah’. ‘Messiah’ is done every year and usually there are four soloists, there’s full choir. You’ve probably heard some of the choir stuff, like the Hallelujah chorus and things like that. And then the orchestra was behind us. So usually it’s classical music as you know it. You’re young. You’ll learn. There’s no emotion here. (laughs) Right? But they’re absolutely lovely, you know. And the other singers are just exceptional. So it’s great to get back to my roots a little bit and also bring a little bit of something else inside this thing. I do the music exactly how it’s written, precisely how it’s done, but with some flair. Something really modern. If we’re not mistaken, it was the classical thing that actually brought you to Australia in the first place? Exactly. So I guess it’s coming back. And this was my Australian debut of classical music in this way. So I guess now that the gate’s kinda been thrown back, it’s time to maybe do something even more interesting with it down the line. Last time we chatted, we talked about your classical upbringing and the fact you had to unlearn some of your classical habits to embark on your pop career. Have you now had to unlearn some of you pop habits? Yeah. It’s very difficult, because I’ve found that I was trying to go back to what I was doing a year and a half ago. And I realized that actually even in my classical stuff, I was doing a lot of pop stuff. A lot of stuff that I shouldn’t have been doing anyway. But why am I going to get rid of that now? Now isn’t the right time to get rid of it. What’s interesting is that it’s opened up my brain to things that I was so rigid about before. I have to wake up every morning, I have to put on my cap, I have to warm up for hours, get my voice perfectly in the pocket and of course when I do it on stage, it all goes out the window. As it does. But that’s the craft. Let’s talk about the ‘Boom + Bust’ EP (thanks for letting us premiere that ‘Kings & Queens’ video again, by the way) and how you felt it was received on the whole? I think it was received well. I definitely got a lot of people from different places that I hadn’t connected with before on board. So definitely as opposed to the stuff that had happened previously, which was very Australian-based, I think in a way some people in the UK started paying more attention, because ‘Kings & Queens’ was on the new music playlists there. So suddenly they realized that this artist has more than just this one song that they’d maybe heard of at some point in time. So I think I actually created a base of some sort. Whereas before, it was just ‘songs’. It had to happen. It literally HAD to happen, because if it didn’t, I would just be this guy who’d released a couple of singles, which would be a shame. I do a lot of different types of music, so I have to start exposing people to the different kinds of style. Right. It was a dance EP. People have been playing it in different places. There’s a lot of clubs, even in the UK right now that are just starting to discover it. These underground R&B places. I didn’t even realize that I was writing the music in that context. I was a bit Nicki Minaj… What I was thinking was pop, they were thinking was R&B, you know? So it’s fascinating to me, especially being so green in pop, what this is going to be taken as and how people are going to consider the music. I have no idea. And I think in a way, Sony is sometimes a little dumbfounded by that too. Because what I’m doing vocally is so different. So everyone’s usually sat there thinking, ‘we really like this, but we don’t know what it is or where it’s going to hit’. So it’s been a pretty full-on ride. Pretty cool. You can use that analogy, by the way. I have a ‘B’ buckle. And I have a baseball cap with the ‘B’ on it. Wearing the different hats has been interesting. I opened for GRL a couple of months ago in Sydney. They’re back and I’m really digging their music. I love Jazzy… she’s really cool. So I opened with ‘Last Dance’, but just the beginning, and then I went into my set. It was so cool to see the reaction. I started it off almost borderline operatic. But the thing is everyone’s starting to not notice that as much. It’s interesting. I sing very full voice and especially in a club, because I don’t need the microphone. And it’s so cool, because people are just dumbfounded. They just have no idea what’s going on, especially if they’ve had a couple of drinks. And let’s face it, they probably haven’t seen that kind of thing before in a club atmosphere. Everything’s starting to merge together a little bit and I’m hoping I won’t have to take the armour off and put on the cape and switch. Because it will start to become a little more together. But we’ll see, you know. Some of the viewers just adored the Brandenburg stuff. And some of them adored it but thought I was trying to infuse it with a little pop. So everyone has their own opinions. Does the classical audience look down their noses at you because of your pop leanings? I think people are beginning to understand more and more how important it is. The fact is, the reason I thought this was so interesting for me to go into – besides the fact that I love pop music – was because I was in New York and would do all these operas and when I left New York I had two contracts with City Opera, I had another contract that I was maybe going to be doing with The Met or with Philly. All those things went under. Completely went bankrupt. Then Sony here opened the door and I said, ‘yes’. I had my whole year scheduled and then it all went ‘bing’. I thought, ‘I’m not going to redo this year. I’ll just start something new’. We sit around thinking ‘how are we going to make opera relevant? How are we going to make young people come to see opera?’ And the fact is that you can’t just do the same thing that’s been done over and over again if you want a new audience. The new audience knows that that’s what opera is. They saw it when they were younger. They saw the men in these weird pink tuxedos. So the fact is, it’s adapting. And I really believe that’s what I was doing in the ‘Messiah’. And I believe that Paul, the artistic director and conductor for it, saw that as well and helped nourish that. He liked that. He likes to push boundaries. It’s difficult. I’m not going to lie. It’s difficult. It’s a challenge, because I don’t get the Aussie support as an Aussie performer. Which is very big here… very important. Especially when you’re starting out. It’s very important to have the support of your own. Even in ‘Messiah’… I’ve been here for a year and a half, but David – who’s a wonderful bass – he’s the Aussie. I don’t think I’ll ever be supported by Triple J, for instance. Triple J to me is pop. Of course, this is the interesting thing… I perceive all the music that’s coming out of Australia so differently to how the Australians see the music coming out of Australia. So I listen to Triple J and think, ‘that’s all pop music’. The only difference between my pop music and theirs is that mine is shiny, shiny, shiny pop and theirs is pop. I love Triple J. I think it’s amazing that a radio station like that has been able to bring so much music to people. And this isn’t some kind of thing about Triple J here. I’m just saying that even if my music was a bit more like that, it still probably wouldn’t happen. So it’s kinda like, ‘what an interesting place to begin’. I think we’ve done incredibly well considering and I think the Australians have really taken me on so much more than I could have ever dreamed. So I actually feel very, very welcome here. Considering Australians are super, super humble people. I like to think that I’m humble, but I know that I don’t always come across as humble. In my mind I’m humble. People come up and thank me for performing and I’ll still be thinking the million things I could have done better. So for me I’m humble in my mind, but I don’t think it comes across because I’m so Miami, so New York. So considering… and everything I’ve heard about what Australians don’t like, I think I’ve been very blessed here. I think people have accepted me in a really strong way. And speaking of Australians accepting you… Ms Courtney Act certainly has! That was a Mardi Gras hook up. We met at Fair Day last year and ended up talking. I was singing at the Main Stage. Honestly, I got her really drunk. Like, really drunk. And then I said she had to come into the studio. So that was sort of the preface for this… ‘Courtney, I’ll make it sound fantastic, I promise’. Did you know about her musical background prior to meeting her last year? I had seen Courtney on ‘Ru Paul’s Drag Race’. I wasn’t really a watcher of ‘Ru Paul’s Drag Race’, but that year… I knew I was going to Australia for seven weeks to do this tour with a pianist friend. ‘I’d heard that there was an Australian on the show, so I tuned in to see if I maybe could learn a little bit about Australians. Or something. So Courtney was this person who I’d been watching on this program. What’s fascinating is that all the Australians know of her because of the ‘Idol’ competition, but in America, she’s really big. I mean like really, really, really, really big. I think it’s sort of underestimated just how popular she is there. That happens to lot of Australians though. They do it here, then they go off to some country and do ‘XYZ’. What tends to happen is that we don’t support them when they’re here at home struggling to make their way, but when they make it big overseas, then we claim them as our golden children and support them. Like Sia, for example. We were just talking about Sia… crazy. I’m working on an album… that will happen after ‘Dance Again’ and we were talking about what she did. And I just think she’s so unbelievably inspirational, because after how many years of performing? Is 20 maybe a good number to throw out there? More, probably. But she found an avenue… a way to create her music, put her voice in it and feel something so singular in all this music that you hear it and you feel exactly what she’s feeling. And she’s not listening back to what she’s doing. She doesn’t care what it’s sounding like. It’s so direct. And I try so hard to do that on stage and I want so hard to word towards that goal where I’m not listening to what I’m doing. Of course, that’s so hard for me. But really, that’s the goal. Sia’s stuff came out right around the time that I was doing ‘Frequency’ and I immediately went, ‘that’s the new goal’. That’s the five/ten year plan. Just the way that she delivers. It’s unbelievable. So let’s talk about ‘Dance Again’. The plan has been that we’ll put it out there, we see what happens and then we start working it. We want people to play it in clubs… it’s a much more broad plan than my other pop songs, which were more about, ‘let’s try to get this singularly to this…’. And, of course, Courtney… she works every day. This girl is performing every day. So the fact is, every time she’s doing something, ‘Dance Again’ starts hitting. Not only does she perform every day, but obviously she has to transform into Courtney every single day she’s working. That must be exhausting in itself. Oh yeah. Oh yeah. She’s a beast. She’s incredible. Back to the album, meantime. You mentioned last time we chatted that you’d (quote) “really, REALLY love to do an album”. But something experimental, you said. How’s that coming along? Obviously this will all be reveal-ed (sorry to make a Handel reference). Obviously the EP was very experimental. It was very much just seeing all these different angles and working out what parts of those different angles I really liked. And what I’ve performed that has struck chords with people in real life. Because really, at the end of the day, I want this to come back even more to performance. To really be able to do it for people and for them to hear my voice live. Because that’s really where people can feel what I do. So ‘Frequency’, I think… Whenever I’ve performed it live – and I opened the ICC Theatre, I performed with Delta a couple of months back, and that song. Delta… that’s a beast right there. That voice is… Her voice is unreal. Unreal. So yes, I did it on the stage and what I realized is that that soul aspect… that real soul music aspect is the part that when people hear it in real life, they feel it. Because artists don’t actually do that anymore. Even Human Nature. They’re amazing singers – and they’re doing all the Motown stuff, but because they have to combine these voices together, this other aspect of the music isn’t there, because they’re doing another aspect of that style. So what I realized is that I think the reason that ‘Frequency’ hit is because people could feel a musical sound and a vocal production that they just don’t really get to hear. It was layered to the hilt, wasn’t it? Vocally. There were so many different layers to it. Well, yeah. There were a lot of different places that it went to and everything. But besides ‘24K Magic’… everyone’s dying for that soulfulness. Because it’s so cool. That old sound, but made new is so amazing when it’s done well. I’m working with Louis Schoorl, who had done the EP, and he’s just brilliant with the guitars and the… he’s an awesome drummer too. So I’m just like… there’s something in that. So it’ll be your own brand of 24K Magic, is what you’re teasing us with. It will be like that. I’ll be like Eva Cassidy in it, there will be a lot of dimensions, but it’s in that world. I really want people to be able to experience my voice. That’s really what I want in this album. I want people to hear every single aspect of my voice. But now that that’s done and that’s out there, now I can go on to the actual emotion. Well, given that the album sounds like it’s almost in the bag? Look, I don’t think that I’m supposed to say that much about it, but I’m really, really excited. There’s just some demos. And honestly, considering the fact that they were recorded very quickly, they’re really solid. And that’s not even going to be the final thing, so I’m just over the moon about it. That’s how your signing with Sony originally came about, wasn’t it? They’d heard some of your demos and decided they had to sign you? Actually I went in and Ross Fraser from Sony had come to the performance and they said, ‘why don’t you come and sing a little something for us in Sydney?’, so I went in, they asked me if I wanted a piano. I said ‘no’. I went in completely alone and I straight up just sang for 15/20 minutes for the team at Sony. They just thought I was a psychopath. I sang every single style of music that I could possibly dream of and they were… ‘wha?’. They wondered that they were going to do with me. And that’s sort of been the thing. What ARE we going to do with him? 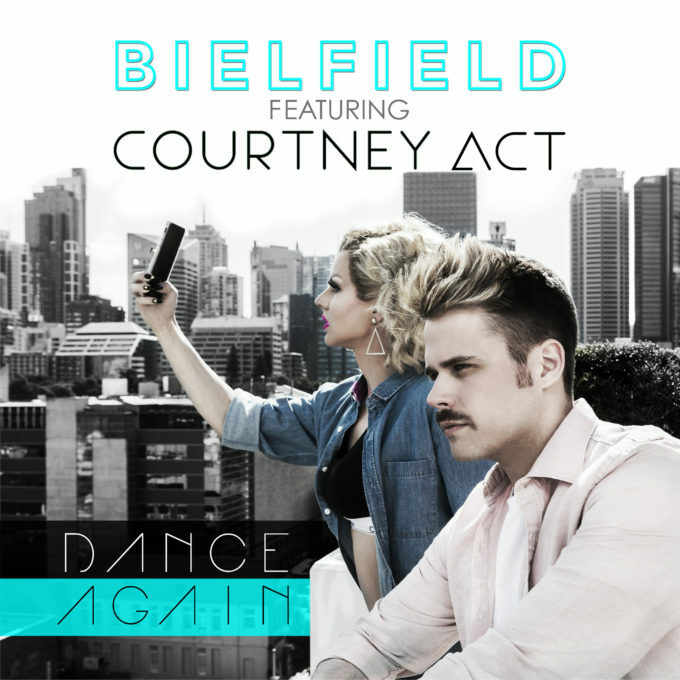 The Bielfield/Courtney Act single ‘Dance Again’ is available digitally now.